(Al Hartmann | The Salt Lake Tribune) Ammon Smith has outdone himself again this Halloween season dressing up his home along 900 East in Sugarhouse. He's done something wild and scary in his yard for the past five years. This year it's King Kong. (Al Hartmann | The Salt Lake Tribune) Ammon Smith has outdone himself again this Halloween season dressing up his home along 900 East in Sugarhouse. He's done something wild and scary in his yard for the past five years. This year it's King Kong. Neighbors stop by to check out the display Thursday Oct. 12. (Al Hartmann | The Salt Lake Tribune) Ammon Smith has outdone himself again this Halloween season dressing up his home along 900 East in Sugarhouse. He's done something wild and scary in his yard for the past five years. This year it's King Kong. (Al Hartmann | The Salt Lake Tribune) Ammon Smith has outdone himself again this Halloween season dressing up his home along 900 East in Sugarhouse. He's done something wild and scary in his yard for the past five years. This year it's King Kong. (Al Hartmann | The Salt Lake Tribune) Ammon Smith has outdone himself again this Halloween season dressing up his home along 900 East in Sugarhouse. He's done something wild and scary in his yard for the past five years. This year it's King Kong. (Al Hartmann | The Salt Lake Tribune) Ammon Smith has outdone himself again this Halloween season dressing up his home along 900 East in Sugarhouse. He's done something wild and scary in his yard for the past five years. This year it's King Kong. 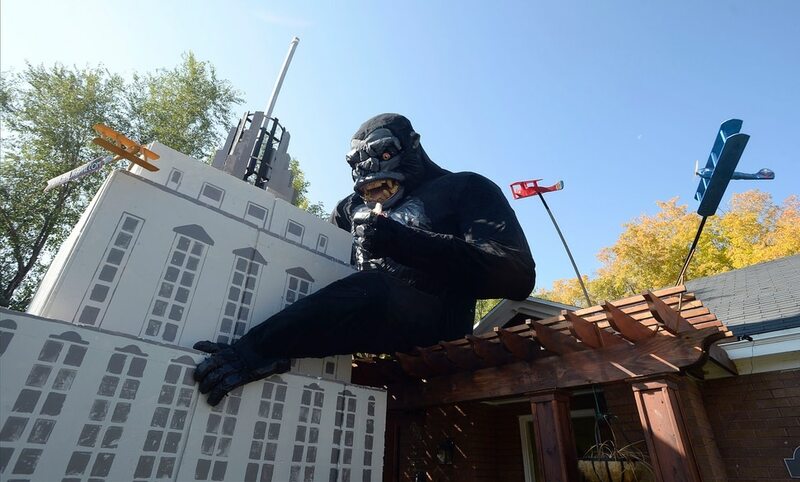 (Al Hartmann | The Salt Lake Tribune) Ammon Smith has outdone himself again this Halloween season dressing up his home along 900 East in Sugarhouse. He's done something wild and scary in his yard for the past five years. This year it's King Kong. 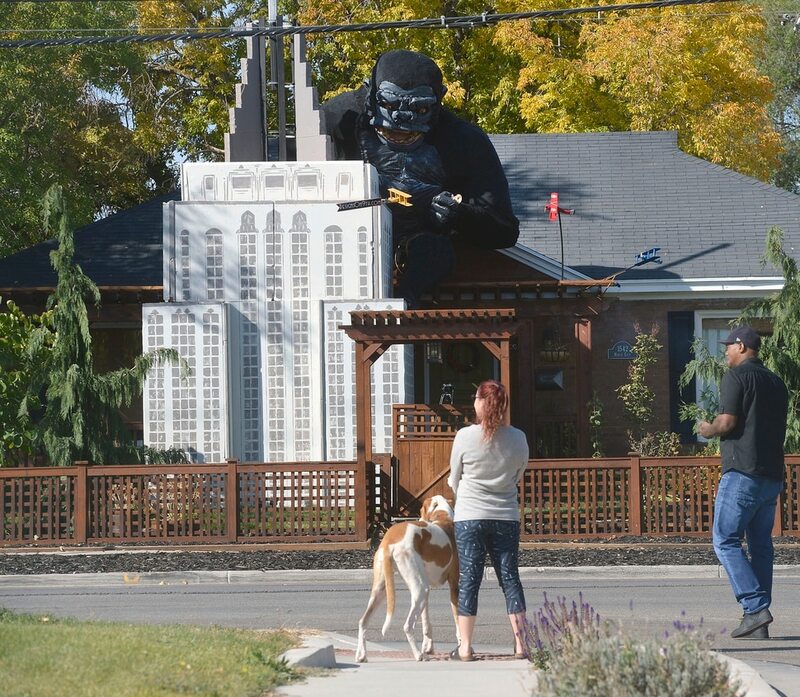 (Al Hartmann | The Salt Lake Tribune) Ammon Smiths has outdone himself again this Halloween season dressing up his home along 900 East in Sugarhouse. He's done something wild for the past five years. This year it's King Kong. Poor Barbie as Fay Ray. Ammon Smith won’t deem himself a “Halloween nut,” but he won’t settle for a few carved pumpkins displayed on the porch. He’s gained local notoriety for his massive displays — graveyards, pirate ships, fire-breathing dragons — that get bigger every year. 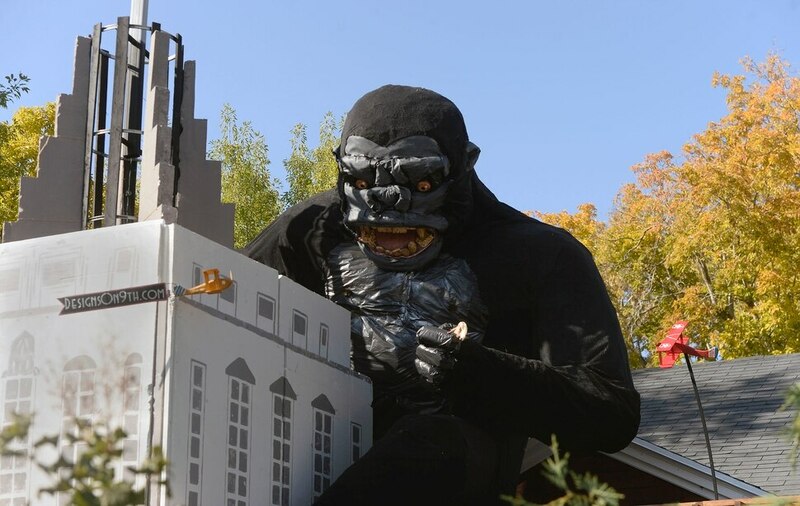 He’s also not a King Kong fanatic — he doesn’t think he’s ever seen the original 1933 film — but the giant ape was an obvious candidate to take up residence on Smith’s home near 900 East and 1500 South, complete with Empire State Building, bi-planes and a Barbie doll clutched in one fist. The 33-year-old woodworker found a love for extreme decorating when his wife asked him to outfit the house for Christmas in 2011. For the following Halloween, “the best holiday on the planet,” according to Smith, rolled around, he went bigger. “I built a 9-foot pumpkin-headed guy that was holding up a bunch of other lit-up pumpkins,” Smith said. “I got so many neighbors leaving me little notes saying how they thought it was so neat because they could see me building it in my driveway. The pumpkin-head man was followed by an elaborate graveyard, then a pirate ship, a skeleton train and, in 2016, a viking ship in the front yard with a fog-breathing dragon perched on the roof. Smith has been fascinated with the process of building and crafting since childhood, when he’d make forts and treehouses. It’s now also his full-time profession — a year and a half ago he started his own company, Designs on 9th, and builds furniture and other “interior elements.” He uses leftover and recycled materials from various projects to bring his Halloween visions to life. The idea for the Kong decoration came in August, with serious construction starting in September as Smith tacked together a wooden box to form the ape’s body. “Then I just added thin strips of wood to build him out until I was happy with the shape of him,” he said. Smith used chicken wire to round out the wood frame of the gorilla and make it more realistic. The sheen on the gorilla’s chest comes from a trash bag. His fingers are made of pool noodles. The project took “80 to 100 hours” to finish, Smith said, but cost only $130 — mostly for black fabric to make Kong look more lifelike. “All the cost goes into fog juice and candy, which is kind of expensive, actually,” Smith said. The Empire State Building has a wood frame but is mostly built from styrofoam he got for free from a friend. He stamped on “windows” with a felt-covered block of wood dipped in paint. Now the whole neighborhood is taking part in the fun. He’s found notes with kind remarks from passers-by taped to his door and seen people photographing his yard as they pass it by (he encourages people to pull over rather than try for a drive-by shot). And, to his surprise, he hasn’t gotten any complaints from neighbors over the outsized movie monster. Smith promises that he’ll have plenty of candy to accommodate trick-or-treaters who travel to the neighborhood on Halloween. The display will be promptly taken down as the calendar turns to November, said Smith, who plans to reuse the styrofoam to insulate his garage and build other projects with the wood. He’ll hold on to the chicken wire and fabric for next year’s display. He doesn’t know what that is yet — just that it’ll be unique. “We try to do something a little different every year than most people would do,” Smith said.